I love the ritual of preparing the bike and myself to leave every morning. I check out of the hotel and take 15 or so minutes loading the bike checking everything is ok before I head off. The start of the ride was dull and boring, I could have been in Essex! I played Oasis ‘what’s the story’. The last time I listened to it was on my first few miles out of Calais on day 1 when I was full of emotion! Today I just listened to the music, great music, one of favourite albums. 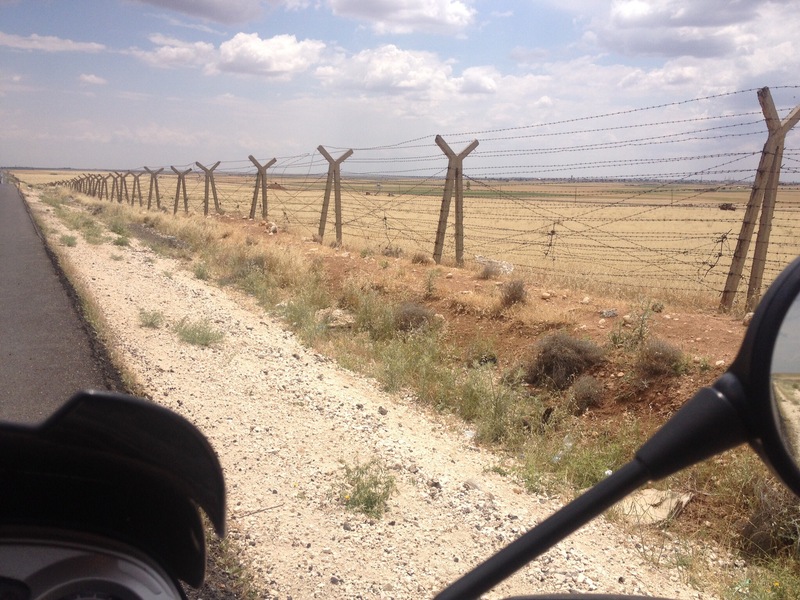 As I headed towards Iraq Syria was a few miles on my right, ‘no man’s land’ was just over the fence next to me. No man’s land was 500 metres across and every 500 meters there was a look out tower or military vehicle with guns. I was thinking about the troubled world they live in, I was told Turkey has taken many Syrians into their country, unfortunately many beg on the streets of Istanbul. 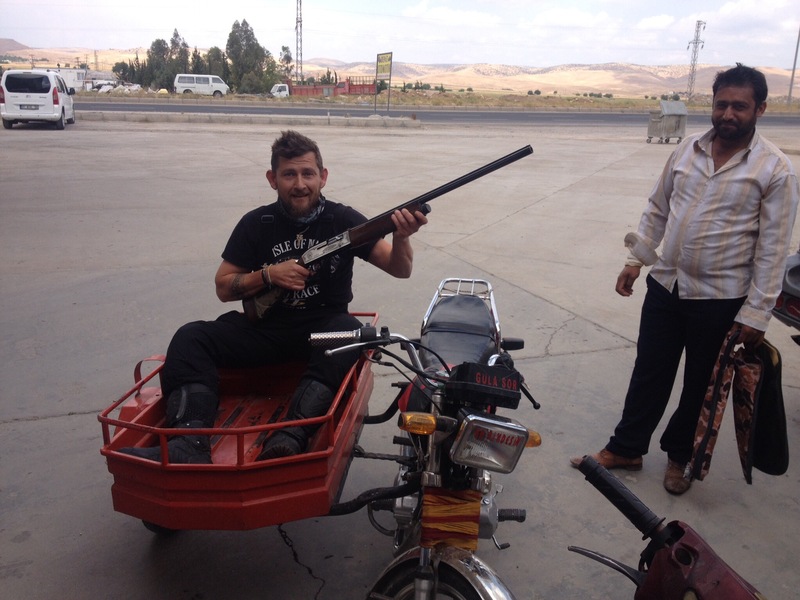 I stopped for morning tea at another run down petrol station as I prefer these to the newer ones and a couple of guys turned up on a motorbike with sidecar, we started talking and then I sat on his bike, then in the sidecar and he gave me his gun (this wasn’t a Toys’R’us’ gun) to hold! I’m not sure if he wanted me to shot someone or what? The road was straight today and after about half way the cars seemed to disappear and it was 99% lorries! the lorries heading East seemed full and empty coming back to the west. To the north of me were mountains about 50 miles away and to the south was Syria, open dusty land as far as the eye could see, the wind heading up from Syria was strong I had to wrestle with the bike to keep it on track. 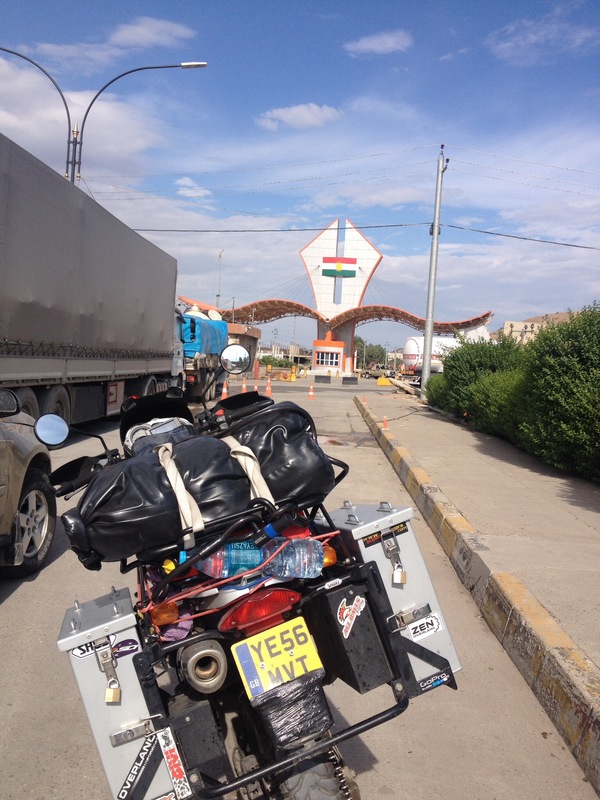 I stopped again just before my destination, Silopi, which is about 5km north of the Iraq boarder to tape over my Union Jack flag badge and GB letters which were on the back of the bike. Necessary, I don’t know but it felt right. Travel for me is about going with my feeling based on what local people say and what I see minute by minute. There is a time for being cavalier and I didn’t think this was it. 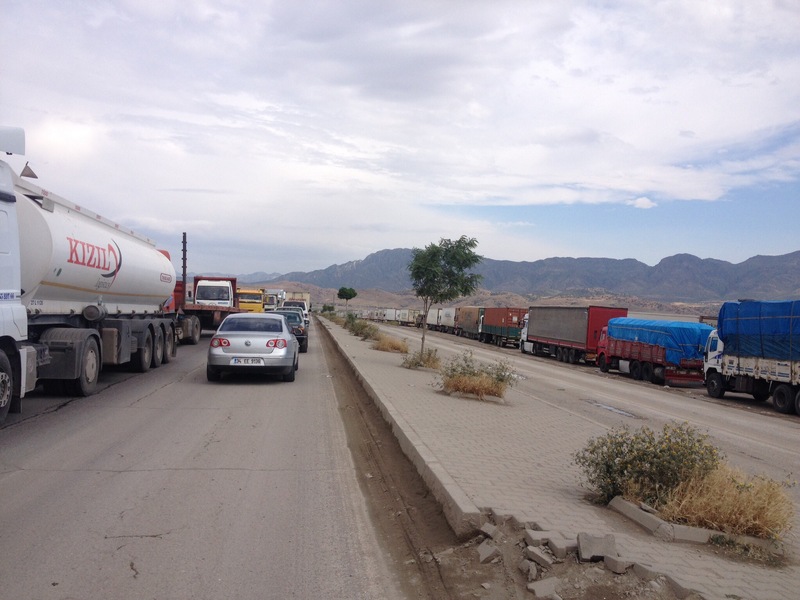 I had planned to stay in Silopi and leave early in the morning to cross into Iraq but as Silopi is one big mechanical workshop come breakers yard I rode through. It was only 2.30pm surly I could get into Iraq before the evening. 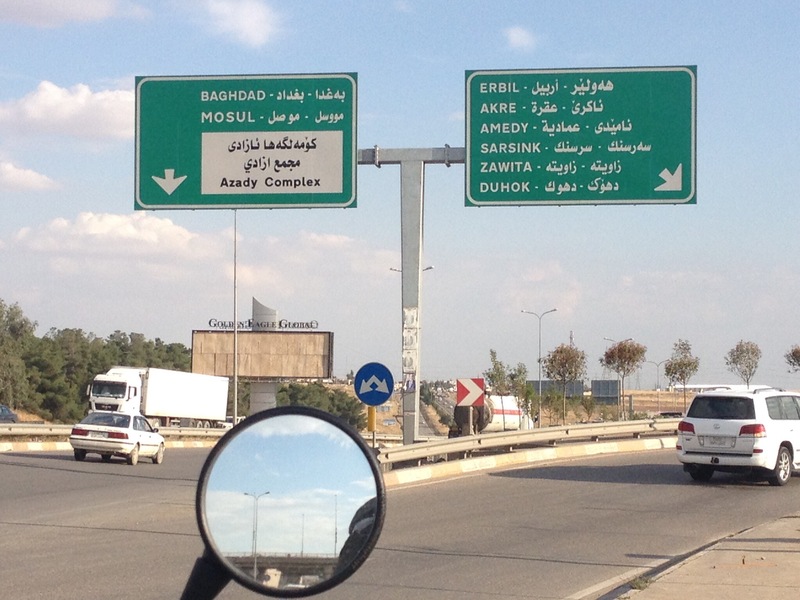 The lorries entering Iraq were queuing for miles, I imagine it takes a day for them to enter? I rode past them and got to the passport booth, they were friendly, looked at my passport and told me to continue. It took me 1 1/2 hours to get in which was less than I anticipated. The boarder was very busy but as I was the only European crossing I had no one cueing at my check points. I lost count at 7 or 8 different offices I had to visit, everyone was smiling, efficient and curious about my travels. I couldn’t tell you all of the processes I went through but the usual passport checks, getting a 15 day visa which was free, the bike documents and then the bike was inspected and the chassis number etc recorded. I was eventually taken to someone high up as he had a grand desk and looked important. He asked me why I was here and I told him, he told me where I should and shouldn’t go and then gave me sweet cake. The Iraq border guards are fantastic. As soon as I left I had to adjust to new road behaviour, the roads are so wide with no markings, it was ‘a free for all’. I arrived in Dahuk to look for a hotel and about 20 men all surrounded me wanting to shake my hand. What wonderful people. After sorting myself out it was gone 8pm when I ventured out into the city, I had soup, kebab and a can of coke for 50pence and whilst walking around a couple of guys asked me to join them so I did. 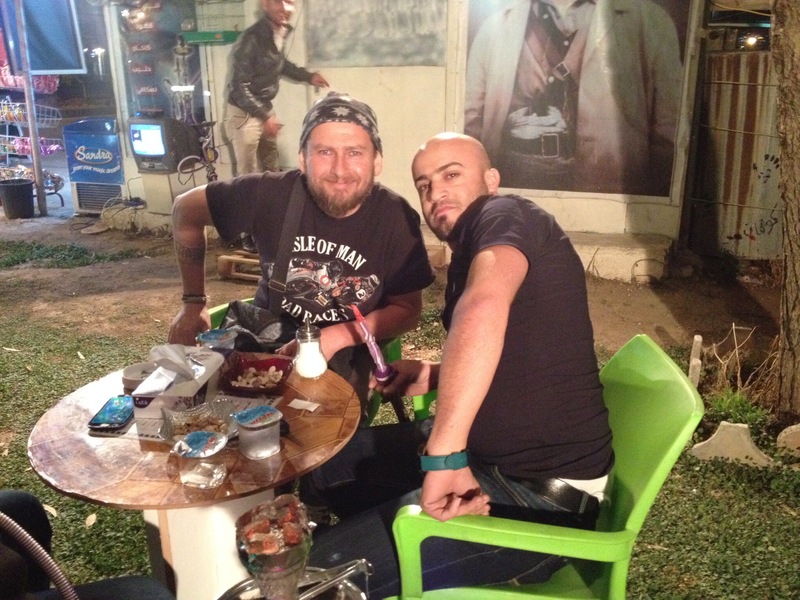 We talked, smoked shisha and later he drove me around the city. 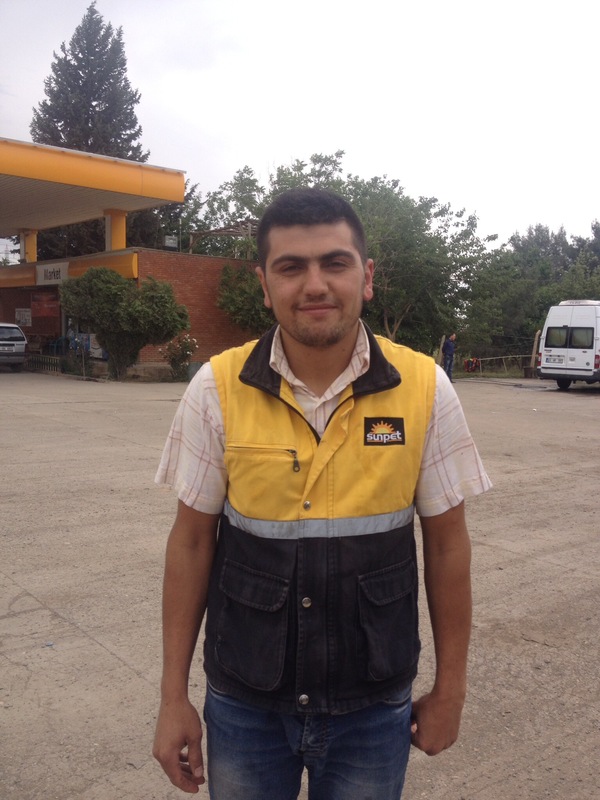 He and his friends are very proud to be Kurdish, it was gone midnight when Dindar dropped me back at the hotel. It makes me scared for you reading all of this! You are traveling… you need to be relaxing on beaches!!!!!!!! Your trip is looking fantastic, Dan. So glad you’re enjoying it so much and it’s making us count the minutes until we leave even more than we have been! Looking forward to keeping up with your travels over the next few months. Stay safe and enjoy the ride! loving the blog!, really sounds like you are having a fantastic time…Anne summed it up well! the people are so friendly…..thats so great!all about it…eh! We were talking about your adventure whilst at Interclean last week and wondering how you were doing. Bet you don’t miss the rat race of selling cleaning machines for a living. We are off to Spain & Portugal on the bike shortly, not quite the same trip but it will be good. great blogs mate, proud of you, what an adventure.